The Kobo Emerging Writer Prize is an award that supports talented debut authors. 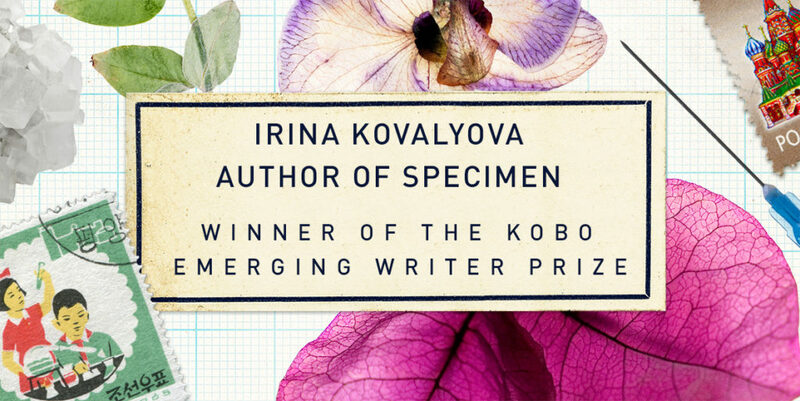 We are very proud to announce that Irina Kovalyova, author of Specimen, is this year’s winner in the Literary Fiction category! We’d like to congratulate all those who were shortlisted, as well as the winners of the other categories. 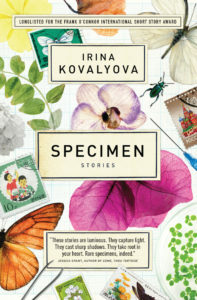 Inspired by a wide range influences — including early-twentieth century Russian avant-gardists, British science fiction and dystopian novels, as well as contemporary Canadian and American novelists — Specimen is a highly original collection of stories that explore the place where physical reality collides with our spiritual and emotional lives. In “Mamochka,” nominated for the 2012 Journey Prize, an archivist at the Institute for Physics in Minsk, must come to terms with her daughter’s marriage to a Chinese man in Vancouver. In “Peptide P,” scientists study a disease of the heart that seems to affect children after they eat hotdogs. In “Side Effects,” a woman’s personality is altered by botox injections. In “Specimen” a teenage girl discovers that she was conceived using a sperm donor. In “The Big One,” a woman and her daughter find themselves trapped in the rubble of an underground parking garage after an earthquake. In “The Blood Keeper,” a novella, a young academic travels to North Korea to work on her dissertation and embarks on a dangerous affair.